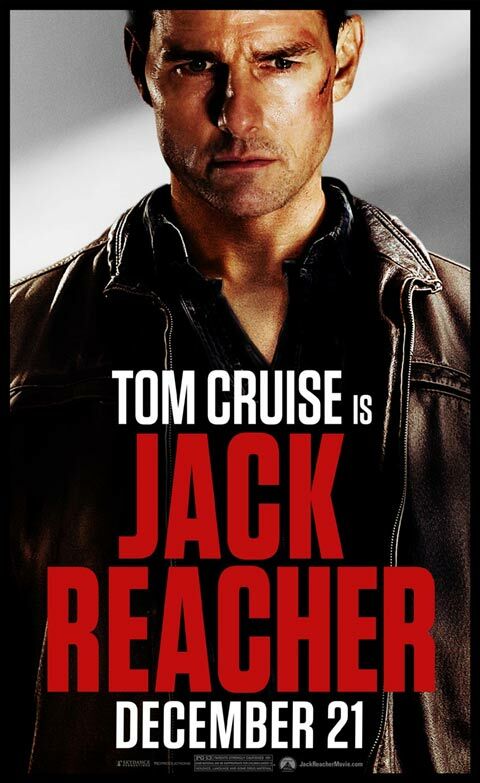 There hasn't been a great deal of creativity at play in the advertising campaign for Jack Reacher. The first bit of promotional material we ever saw for the movie was a pair of stills - but they were basically the same thing: Tom Cruise Looking Cool Standing Next To A Red Car. A little while later we got the film's first poster, which was fine if not ridiculously generic (seriously, you could put any Cruise title underneath it and believe it to be the poster). But now the second one-sheet has made its way out... and it's just a zoomed-in version of the first poster minus the city backdrop. Check out the poster below and click to see it full size in our database. Even Cruise's face in this poster reads something like, "I've seen this poster somewhere before..."
The movie, based on the novel "One Shot" by Lee Child and written and directed by Christopher McQuarrie, begins when a trained military sniper shoots and skills five people while perched in a parking garage overlooking a busy business plaza. The police, led by Detective Emerson (David Oyelowo), collect more than enough evidence to convict a man named James Barr (Joseph Sikora), but when they bring him in he only has one thing to say: "Bring me Jack Reacher." What he doesn't know is that Reacher (Cruise) is already on his way, but not to help Barr - instead he wants to bury him. But as Reacher begins to do an investigation of his own he begins to discover that there's a much bigger plot at play. The film is due out on December 21st and co-stars Werner Herzog, Richard Jenkins, Rosamund Pike, and Robert Duvall. Head over to our Blend Film Database for even more about Jack Reacher.